I have been waiting for this Saturday for a long time. Not that anything special is happening today (sorry for all the Eurovision fans out there)… in fact I had been waiting for today exactly because nothing was happening. The last few weeks have been extremely busy at work and many big projects came to an end yesterday. I was looking forward to this lazy weekend. Lazy or not, I would also have to put in a couple of runs this weekend, especially with all the beer I consumed in the last couple of days; first during Canada’s defeat against Sweden at the World Hockey Championship on Thursday but also last night as a friend wanted to show me a bar in Östermalm which feels like Södermalm, “and has the cheapest beer in town”. Thankfully I managed to sleep in this morning. But at 10:00 am I was hitting the running path for a short 10k around Kungsholmen. Cool and cloudy: the perfect weather for a run, and for not feeling guilty when spending most of the day home, reading a book or watching movies. But before I could settle under a blanket on the couch, I had made plans to meet my Swedish teacher for coffee and to go to a vernissage from one of her friends (I should probably mention here that I could have used the words “former teacher” since I didn’t have any classes since January but I am hopeful to resume classes in the next week or so). Since the vernissage was at a gallery in Gamla Stan, we agreed to meet in that area. 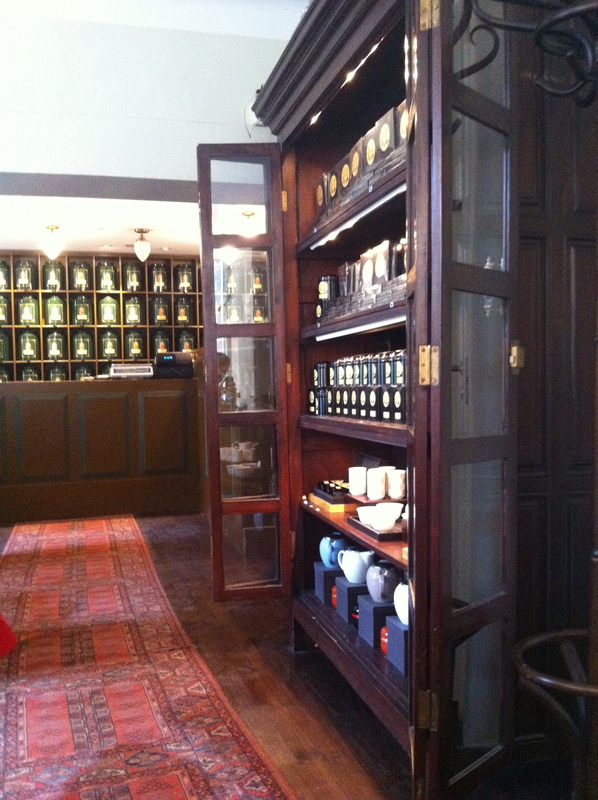 Frankly, I did not really know where we could go for coffee, but my Swedish teacher, who is more into tea than coffee, immediately suggested Chaikhana Tea House. She was probably a regular when she lived in Gamla Stan, but she hadn’t been there in more than five years. Apparently the place has not changed much. 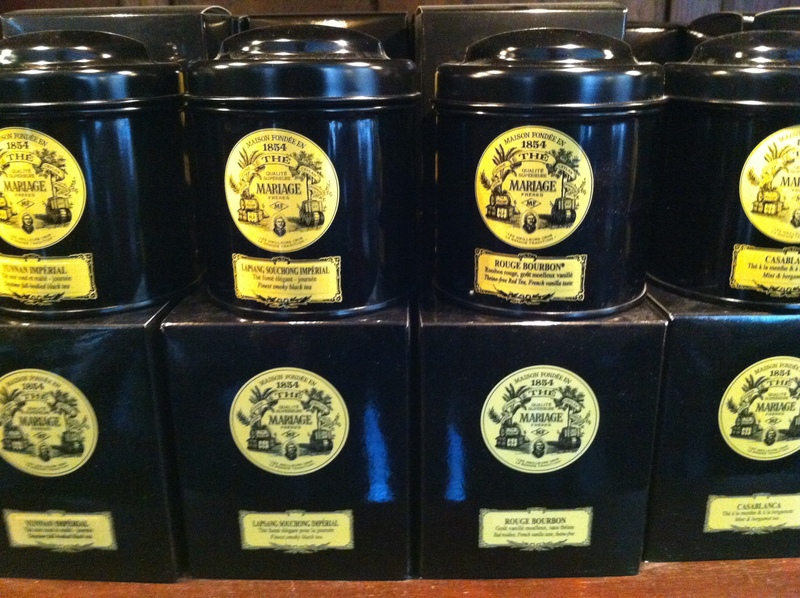 There are many things that are impressive about Chaikhana, starting with the wide selection of teas. We were offered two menus which had a different selection. Obviously, there are also much more options than those on the menu(s). 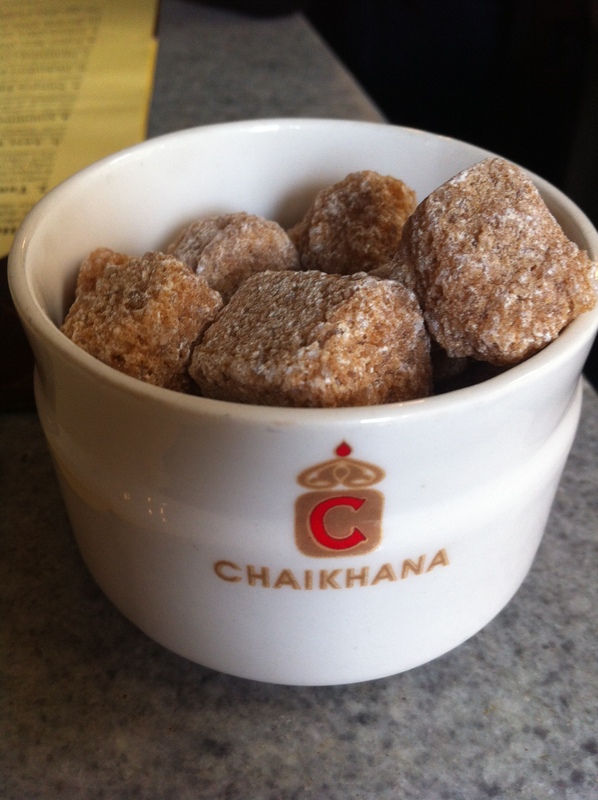 But the most impressive thing at Chaikhana was probably the staff. First, everybody was kind and friendly. They also seem to know quite a bit about tea. 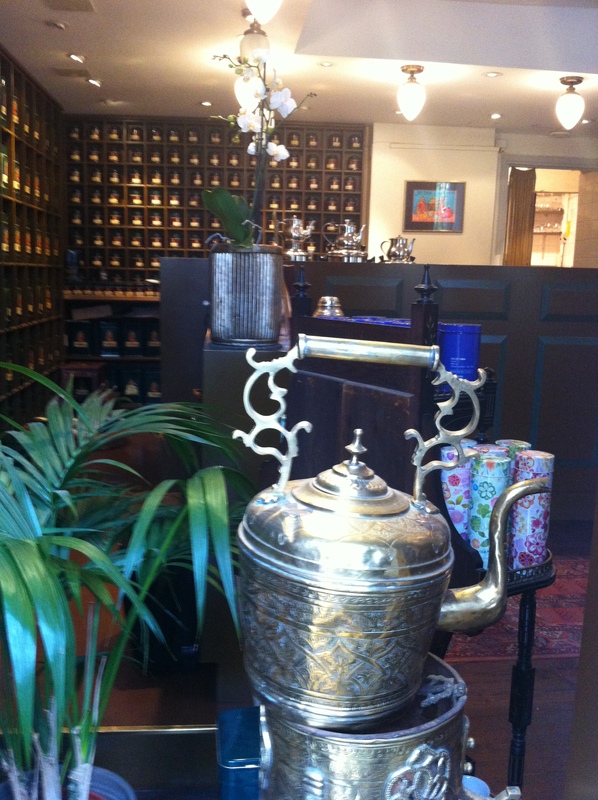 My Swedish teacher told me that when she used to come to Chaikhana, the owner and the staff always had a good story to tell about this particular kind of tea or another, telling the story, for example, of how it was prepared for a Chinese Empress in the 15th century. And as I was paying just before leaving and my Swedish teacher expressed her surprise as a way of thanking me, the man behind the counter, whom I assume is the owner, explained that I was a gentleman. He then went on to complain that too many people in Northern Europe tended to confuse gender equality and generosity. Chaikhana also has a nice food menu. Judging by what other guests were having, the traditional british sandwich seems to be a popular choice. But there is much more on the menu, including croque-monsieur and all kind of sandwiches. Chaikhana also offers nice cakes and pies. And macarons! 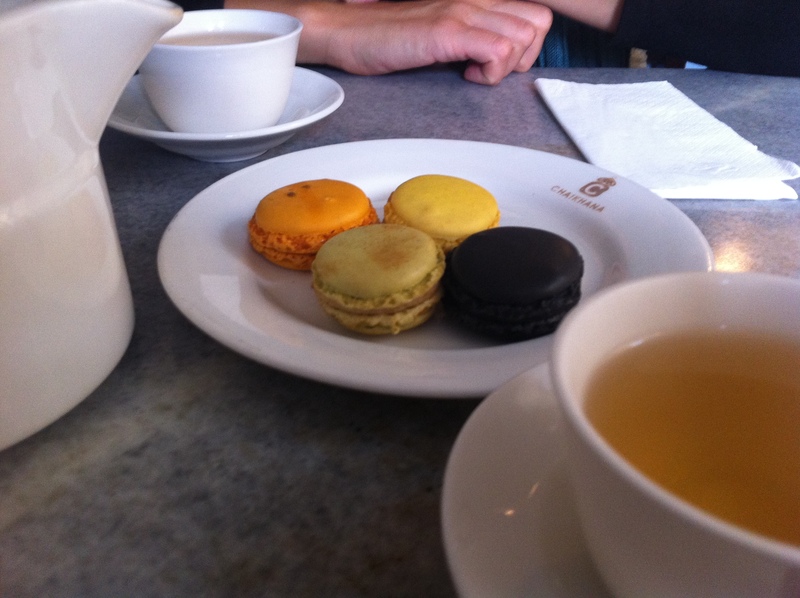 We had four macarons (liquorice, ginger, saffran and lemon) to go with the wonderful jasmine green tea. We tried to speak a bit of Swedish but obviously I was a bit rusty. So we had to switch to English as I told my Swedish teacher all the nice things that had happened in my life since we last saw each other (more than 4 months ago). She also had to speak English to explain how her three-week trip to Cincinnati and Montreal turned into a three-month trip to Miami. It was a nice afternoon. I only wish I could have done this in Swedish. I was wondering how your Swedish was progressing 😉 I want that exact rug for my house – you think you might be able to slip it under your coat the next time you go back 😀 ? Also – do you know how many times I tried to make a perfect macaron like that and it never turns out?! Here is the deal: I’ll get the rug for you but you have to come and pick it up in Stockholm!